This large black bird's Latin name is Haematopus bachmani. They are found in the intertidal area of the Pacific Coast. 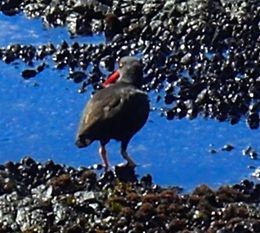 The are a large bird (16 to 18 inches) and they work the tide pools searching for marine worms, crabs, and mollusks. Breeding pairs nest on the ground well above the high water line where the female lays 2-3 olive colored eggs. Pairs mate for life. Due to a number of environmental factors, there are a limited number of these impressive birds on the West Coast.